Use the 34mm add-on card slot of your laptop computer to expand the use of your PCI slots by 4 with full PCI Bus compliance to revision 2.3. The metal case construction supports both 5V and 3.3V Add-in Cards. Ideal for laptop computers with 34mm PCMCIA cards to expand into PCI. 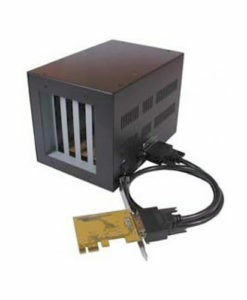 Operates as portable PCI Slot enclosure. Extended Virtual Channel (VC) Support Includes a Second VC for Quality-of-Service and Isochronous Applications. PCI Express Advanced Error Reporting Capability Including ECRC Support. The smallest expansion box for PCI applications! The 34-EXP-PCI4 34mm Express Card to Quad PCI Slots Expansion Box is specially designed to expand 4 extra PCI slots from an Express Card Slot. It includes a 34mm Express Card with extension cable, and the slot box itself. The box is powered by a 12VDC AC adapter. It provides instant PCI bus expansion via the an Express Card from Notebook PC. Express Card (and PCI Express) provides a high-speed, serial I/O bus that maintains backward compatibility with PCI applications and drivers. The 34mm Express Card’s expansion architecture defines a high-performance, point-to-point, scalable, serial bus at speed of 250Mbytes/sec to 4GBytes/sec (and 8Gbytes/sec in the future). The PCI slots of the enclosure are fully Plug-and-Play compatible and no IRQ or I/O address conflict problems. It quickly adapts to new PCI Express technologies for legacy PCI add-in cards and allows you to add PCI connectivity as needed. 12VDC AC Power Adapter is Provided and Required at all times for BOX to Operate. Works great with my Tuner Card!